A group of astronomers from the Instituto de Astrofísica de Canarias (IAC) and the Centro de Estudios de Física del Cosmos de Aragón (CEFCA), have reported the discovery of a massive stellar cluster in the Milky Way. The discovery is part of the MASGOMAS project (MAssive Stars in Galactic Obscured MAssive clusterS), a systematic search for massive galactic stellar clusters. The massive nature of the cluster has been confirmed using LIRIS imaging, and long-slit and multi-object spectroscopy, on the William Herschel Telescope (WHT). The new massive stellar cluster named Masgomas-1 is one of a dozen of clusters with total mass over 10,000 solar masses already known in the Milky Way. The observational census of these objects is far from complete, as more than 100 massive similar clusters are expected in our Galaxy (Hanson et al., 2008). Massive stellar clusters, and their massive stellar population, are highly extinguished by the associated star-forming clouds, and the gas and the dust in the Galactic disc. This observational constraint makes optical near-infrared photometry and spectroscopy the only way to find and study these objects. The MASGOMAS team conducted a systematic search for massive star clusters in the Milky Way using the 2MASS all-sky survey (Skrutskie et al., 2006). From a set of photometric slices in the Ks band, J-Ks colour and Qir pseudocolour (Comerón & Pasquali, 2005; Negueruela & Schurch, 2007), it is possible to identify OB-type stars, and over-densities of massive young stellar candidates in the 2MASS catalogue. These candidates were subsequently observed with LIRIS, using high resolution near-infrared photometry and spectroscopy (in the H and K bands) to allow confirmation of the massive stars. For Masgomas-1 the team was able to complete multi-object and long-slit spectroscopy for a total of 28 stars, of which 17 were classified as OB-type dwarfs and 4 as supergiants. From spectral classification they estimated a distance of 3.53 kiloparsecs to the cluster (in the Scutum-Centaurus arm), an age between 8 and 10 Myr and a total mass of ~20,000 solar masses. LIRIS false-colour image of Masgomas-1. 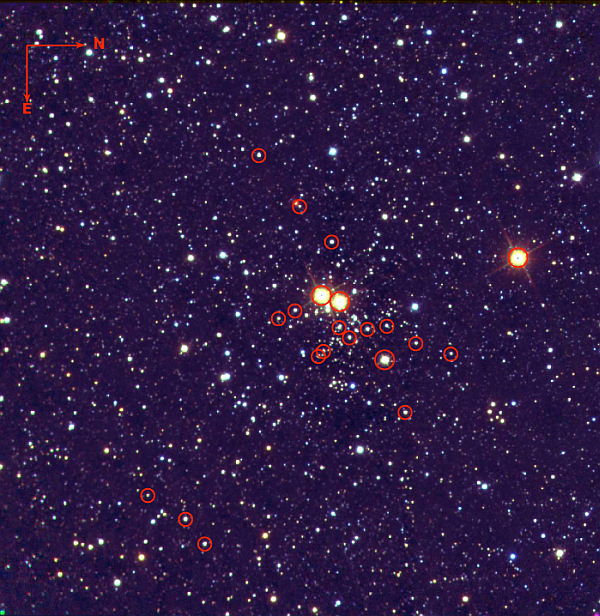 The massive stars with spectral classification have been marked with red circles [ PNG ]. Ramírez Alegría, S., Marín-Franch, A., & Herrero, A., 2012, "Discovery of a young and massive stellar cluster: Spectrophotometric near-infrared study of Masgomas-1", A&A, 541, 75. Comerón, F., & Pasquali, A., 2005, "The ionizing star of the North America and Pelican nebulae", A&A, 430, 541. Negueruela, I., & Schurch, M.P.E, 2007, "A search for counterparts to massive X-ray binaries using photometric catalogues", A&A, 461, 631.